Are you caring for an aging parent, spouse, partner, elderly relative, child with an illness or disability, or another person close to you? 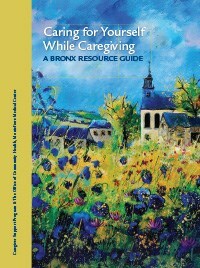 Caring for Yourself While Caregiving: A Bronx Resource Guide, outlines helpful, low-cost resources in the Bronx, including books and websites. It is about making sure that while caring for others, you remember to take care of yourself too. Basic Information on Being a Caregiver. Getting the Support You Need. Exploring Your Creativity/Enjoy Social Life. You can download a free PDF in both English and Spanish. To have a free print copy mailed to you, please email your request to HealingArts@montefiore.org. Remember to include your name, mailing address, and let us know if you want a copy in English or Spanish. To order print copies for your patients or department, please click here for ordering information. To learn more about this guide call 718-920-6576 or email HealingArts@montefiore.org. As the first medical center in New York City to offer families a Caregiver Support Center (CSC), we realize that the role of a caregiver can be demanding, lonely and stressful. At the CSC, we offer family and friends of patients a private, safe,soothing and confidential environment to reflect, talk and hold family meetings. So while your loved one is being cared for in the hospital, feel free to stop by the esc where our specially trained staff will ensure you find the warm, welcoming and supportive atmosphere that you deserve. Come to the CSC to receive comfort and support, and use our quiet areas for privacy, relaxation and personal conversations. For more information, visit us online or contact Lynette Olmo, Program Assistant at 718-920-8080. For more information, visit us online or contact Lourdes Cruz Mendez, Administrative Assistant at 718-904-3599. Services are provided free of charge to caregivers of Montefiore patients.